Laser Fields are as its name implies, deadly lasers emitting from the same type of device housing the Fizzlers. 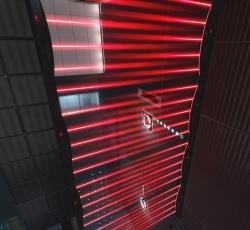 The Laser fields serve as the opposite of the Material Emancipation Grills - any objects can be carried through the beams but test subjects in contact with it will die instantly. It only appears once in the single-player campaign, during the 12th test chamber in the chapter The Itch. The Puzzle Creator, part of the Perpetual Testing Initiative, also has a working laser field that can easily be placed into community-made testing chambers. Discouragement Redirection Cubes cannot redirect any of the beams in the laser field. This page was last modified on 3 April 2013, at 13:51.